Here are some frequently asked questions about the bus drivers, labor negotiations and how the strike impacts students and families. 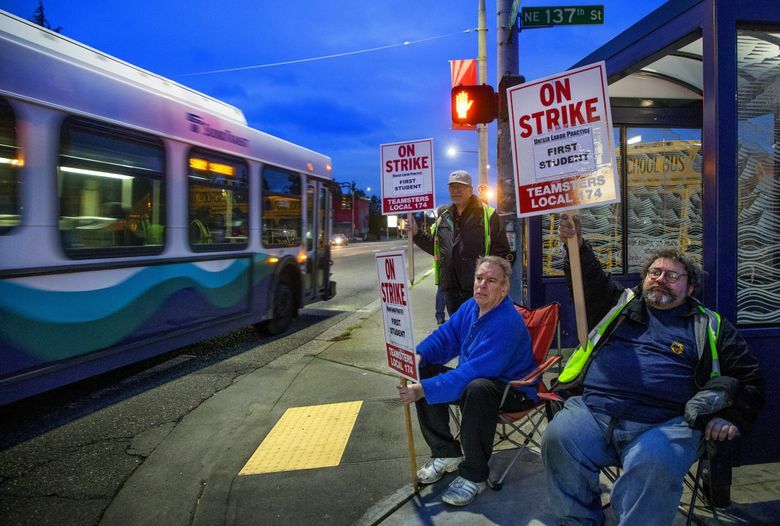 Seattle’s 400 school-bus drivers went on strike Thursday and, based on the bus-driver union’s previous negotiations with the contractor First Student, it doesn’t look like it will be ending soon. First Student is in the first year of a three-year contract with Seattle Public Schools. The contract is worth at least $27 million a year. Teamsters Local 174, the union representing the bus drivers, says First Student promised to negotiate health care and retirement plans after the company finalized its contract with the school district. The two sides have been in contract negotiations over benefits for months. First Student presented another proposal Monday, which the union rejected. Teamsters then declared a strike. Didn’t the union already go on strike? The drivers want more affordable health benefits and a stronger retirement plan. 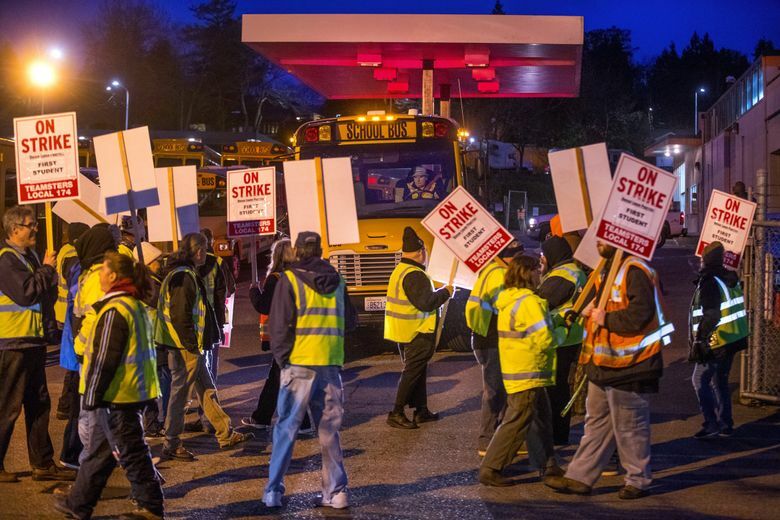 On the picket lines, bus drivers told stories of having to declare bankruptcy, pay for expensive medication out of pocket or live paycheck to paycheck. First Student said it “supports and cares deeply about employees” and that the company offers competitive pay and benefits. What do bus drivers earn? Bus drivers are paid between $18 and $25 an hour, and drivers who work 30 hours a week or more are eligible for health-care benefits. What have the two sides proposed? What does the school district think about this? What about teachers? Superintendent Larry Nyland said at Wednesday’s School Board meeting that the issues are between the union and First Student and that he hopes they’re resolved soon. The school district sent a letter in October threatening to seek damages of $1.2 million per day from First Student if a strike occurred, but it’s unclear if district officials will follow through. 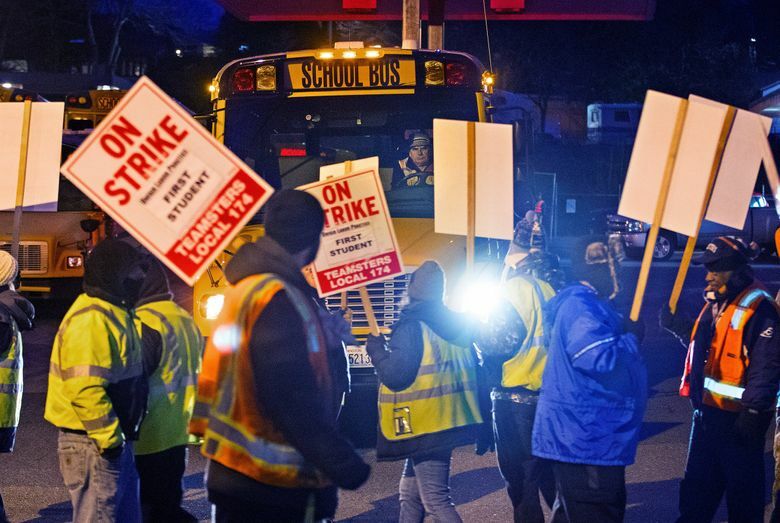 If the strike continues through next week, Seattle teachers union members plan a walkout Wednesday at their schools and to picket in different areas of the city. Union members won’t leave until after the school day has ended, so students won’t be affected. Couldn’t the school district use another company or provide their own buses? First Student was the only contractor to respond when the school district sent out a request for bus-service proposals last year. Several vendors initially were interested but didn’t submit proposals, citing expensive startup costs, especially those associated with finding land for a bus lot. Other districts provide and coordinate their own buses, but that’s expensive. How many Seattle students ride the yellow buses? About 12,000 Seattle students use school buses to get to and from school. The district provides bus service to many elementary- and middle-school students, and for students who require transportation as part of special-education services. High-school students who live more than 2 miles from their schools receive cards to ride public transportation. Can my child skip class because of the strike? No. Students who miss school because of the strike, under state law, will receive an unexcused absence. But if he or she isn’t able to get to school, missed classwork, homework and tests may be made up if the classroom teacher approves. Are sports and field trips affected by the strike? Schools use charter buses for sports competitions, so those aren’t affected by the strike. But any field trips scheduled on days of the strike will be canceled. What are alternative options for my child to get to school? The district encourages families to consider participating in a “walking school bus” or “bike train,” where children walk or bike to school together with adult supervision. Parents can contact Yvonne Carpenter at Seattle Public Schools at ylcarpenter@seattleschools.org for more information. King County Metro buses serve all public schools in Seattle, so older students can take a bus. Many PTSAs have school-specific information about transportation alternatives.